Hours before President Trump announced his nomination of D.C. Circuit Judge Brett Kavanaugh for the Supreme Court, Senate Minority Leader Charles Schumer, D-N.Y., outlined his demands for the nominee. 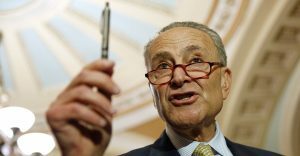 He would, Schumer said Monday on the Senate floor, demand from Kavanaugh “an affirmative statement of support” for certain Supreme Court precedents and positions on particular legal issues. In other words, Schumer will demand that Kavanaugh commit, in advance, to deciding future cases as Democrats instruct him. Schumer will make this demand, he said, because previous Supreme Court nominees “swore to obey precedent” in their confirmation hearing and then, once appointed, voted to reverse some precedents. This confirmation tale is both fictional and brazen. No Supreme Court nominee ever “swore to obey precedent” if, as Schumer now claims, that means promising never to reconsider or vote to reverse any precedent ever. No nominee ever has made such a promise, and none ever would. Let’s look at what really happened in past confirmation hearings. Like Kavanaugh, Chief Justice John Roberts, Justice Samuel Alito, and Justice Sonia Sotomayor each served on the U.S. Court of Appeals at the time of their respective Supreme Court nominations. At his 2005 confirmation hearing, Roberts said that “precedent plays an important role,” and he described how recognized “principles of stare decisis” guide how a court handles its own past decisions. Similarly, Alito acknowledged that the practice of following prior decisions is “very important.” He discussed how “the doctrine of stare decisis” includes criteria or considerations that courts use to decide whether to overturn a precedent. At her 2009 confirmation hearing, Sotomayor described her “great respect for precedent” and said that “all precedent of the [Supreme] Court is entitled to the respect of the doctrine of stare decisis.” Like Roberts and Alito, she discussed how that doctrine includes factors that the court will use in deciding whether to reverse a precedent. Do you see a pattern here? These Supreme Court nominees took the same position and even expressed that position using similar language. The difference between Roberts’ “principles of stare decisis” and Alito’s or Sotomayor’s “doctrine of stare decisis” is somewhere between zero and none. Each of them believes that following precedent is important, each acknowledges that precedent is not absolute, and each has voted to overturn Supreme Court precedent. Schumer’s fictional confirmation tale is also brazen.